PROVIDENCE, R.I. - No. 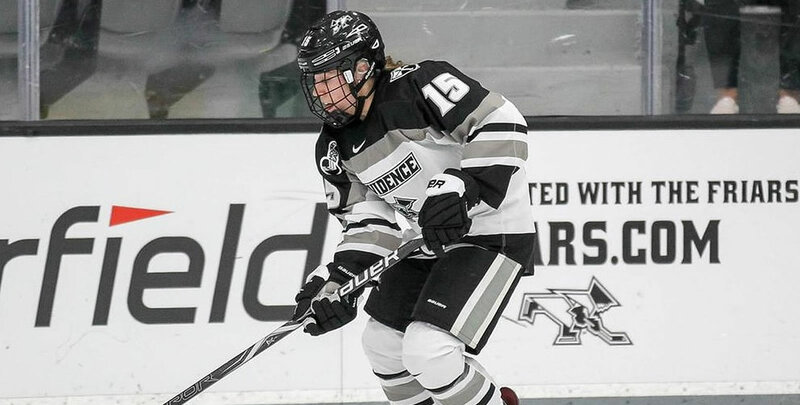 10 Providence College women's hockey team defeated the Merrimack Warriors, 3-1, on Friday night (Nov. 16) at Schneider Arena. - Providence led 8-4 in shots on goal at the conclusion of the first period. - The Friars' best chance of the opening frame came with under two minutes remaining. Meaghan Rickard (Coventry, R.I.) came down the boards and played the puck over to Maureen Murphy (Buffalo, N.Y.). She slipped it over to Christina Putigna (Grimsby, Ontario) who one-timed a shot into the chest of Samantha Ridgewell. - Merrimack jumped out to a 1-0 lead at the 12:51 mark of the second period. Gabby Jones scored on a rebound. She was assisted by Paige Sorensen and Julia MacLean. - Providence got its second power play opportunity of the game with 2:01 remaining in the period. The Friars took full advantage, as Cassidy MacPherson (Oakville, Ontario) scored with 40 seconds left in the period. Her wrist shot from the slot was assisted by Murphy and Whitney Dove (Port Moody, British Columbia). - MacPherson's goal was her third of the season. Murphy's assist was her team-leading eighth and extended her point streak to five games. Dove picked up her fourth assist of the season on the play. - Murphy appeared to have scored the go-ahead goal at the 16:27 mark of the third, but it was waved off after Merrimack challenged the play for offsides. - Murphy solved the situation by putting another puck past Ridgewell just four minutes later. Putigna played the puck up to Rickard who had her shot saved. Murphy was there to bury the rebound. - Whitney Dove added an insurance goal with 2:14 left to play. Murphy won the draw to Rickard who fed Dove at the point. Her shot went through traffic and found the back of the net. - Dove's multi-point game was her second of the season. Rickard, who had two assists, picked up her first multi-point game of the season. - Murphy finished the game with three points. It marked her second three-point game of the season and pushed her multi-point game total to seven. - Madison Myers made 18 saves in her eighth win of the season. Ridgewell made 25 saves for Merrimack. The Friars travel to North Andover for another game with Merrimack tomorrow (Nov. 17) at 4:00 p.m.